Neat and easy living, full of character double-storey 4 bedroom house with 2 bathrooms, 1 guest toilet including shower, generous living area, separate dining room, modern kitchen with ample cupboard. Parking arrangement consists of a 2-car garage with wooden roll-up door, patio and garden with sprinkler system. Stand size: 755m², 380m² Home – R3 000 000. 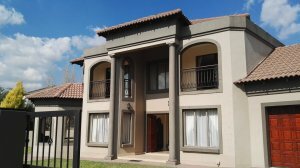 Willow Acres Estate is an upmarket, secured estate with access guard based between Silver Lakes and Savannah Country Estate.